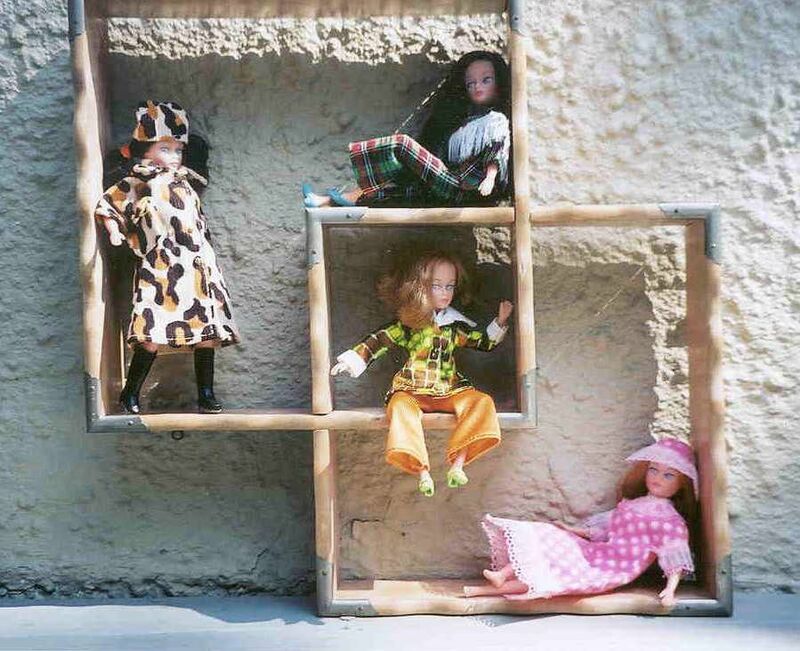 While Dawn's extensive wardrobe harks back to the dressy clothes of the early sixties, Triki Miki's small wardrobe draws on the mod trends of swinging London and the psychedelic styles of the turned-on counterculture. Although some of Triki Miki's outfits are laughably frumpy, Uneeda's simple, strong patterns and clean lines look far more modern than Topper's frothy Dawn creations. 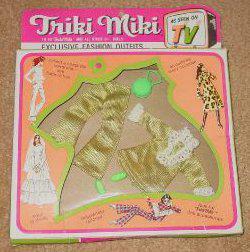 For an opposing opinion, and wonderful photos of many Triki Miki outfits, visit Rob's place at Topper Towers. The LMDs wear some of the coolest Triki looks: clockwise from the left, Fashion Coat, with original hat, purse and boots; Poncho Set, minus the sunglasses; Dream Hours, without shoes or hairbrush; and Holiday Cruise, missing the necklace. Party wear: the white bodice of Frilly Formal is shot with silver embroidery; the bow at the waist is black; the ruffles of the skirt have faded to a pale blue. Miki wears hot-pink booties from a Shillman pack of shoes and purses. Miki lost the coordinating clutch in a flowerbed. 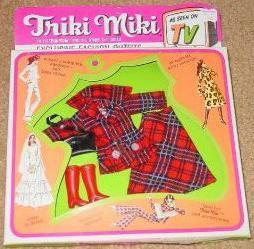 Alexandria North has posted box illustrations of the full Triki Miki line on "That Seventies Doll," her Dawn site. Compare Uneeda's drawing for the Elegant Evening outfit and the actual outfit on an LMD: Dollikin is more the cute and kicky partygoer than she is the gracious hostess type. 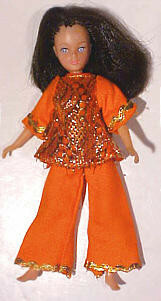 Elegant Evening is the only Triki Miki ensemble that knocks off a Topper creation, Dawn's Tangerama Tunic. For a wonderful photo of a blonde Dollikin in the real Tangerama Tunic, visit Nekonon Atelier. 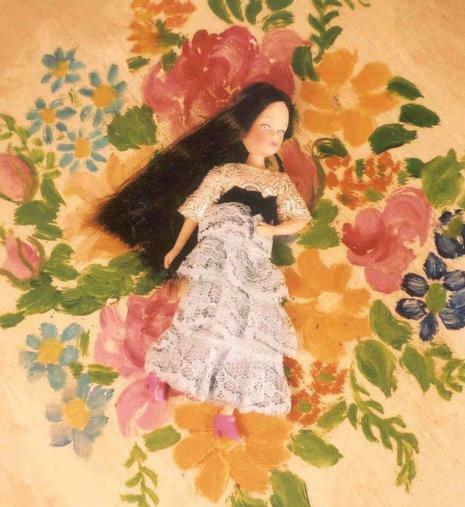 To view NRFB Triki Miki accessories, and the necessary evil, Miki's wedding gown, check out Kat Robertson's Overzone encyclopedia of diminutive fashion dolls. 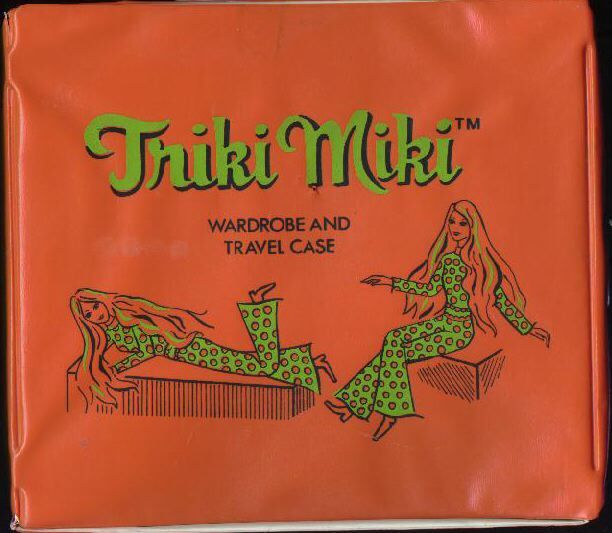 Triki Miki has a wardrobe/travel case that comes up fairly regularly on eBay. This is where a hip Miki will stash her frumpy clothes, like Country Fair, a disastrously abbreviated Granny dress, and Opera Date, a three-piece ensemble which is also suitable for grannies! 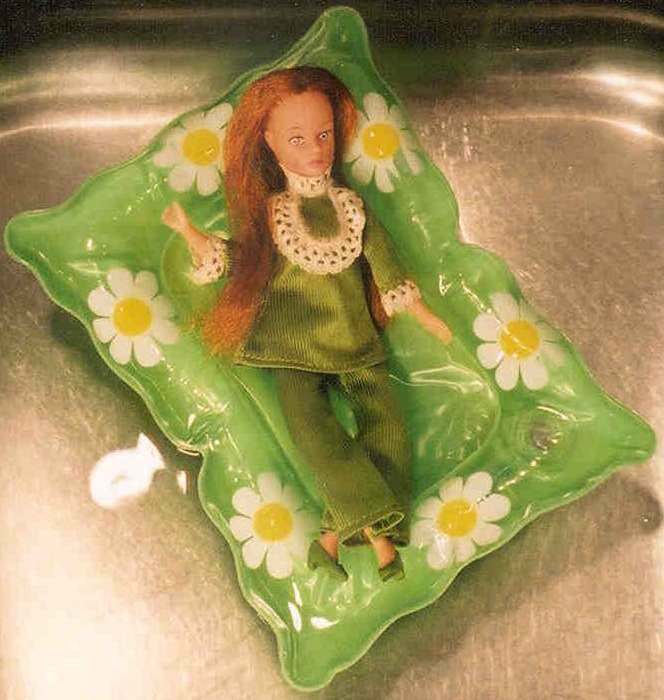 Miki's case contains a doll bay, a clothing bay and an accessories bin. It comes in pistachio green with dirty orange lettering and illustration, or in orange with pistachio detailing. Strangely, both Miki's case and her original box are illustrated with images of LMDs in their polkadot jumpsuits! New! 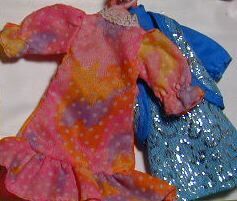 I finally deboxed the very 70s Perky Plaid, and you can view it on one of my LMD reroots.